Educate & Entertain your children at the same time. 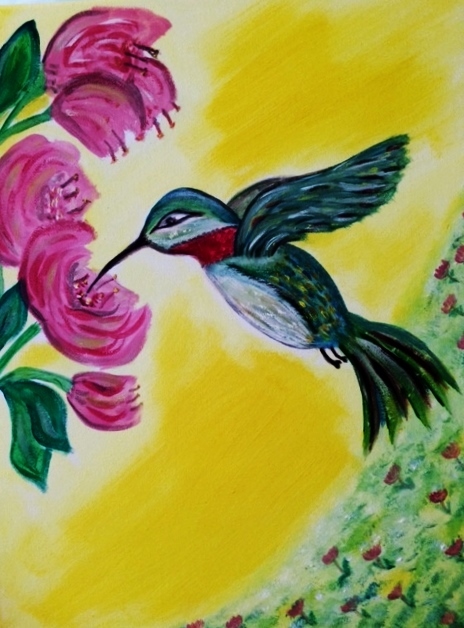 Hummie the Hummingbird is a wonderful story about Pollination and also carries a message about Friendship. The story portrays the perfectly designed partnership between plants, birds, bees, insects, and mammals and their dependency, as well as our own, upon one another for life. The book also brings to light that our own human existence depends upon the respect and good stewardship we bestow upon mother earth and all who share the planet with us. A fun and entertaining book that lets children learn as well as laugh as they turn the pages. This Humdinger of a Story has companion songs: 'Beautiful Bird' and 'Just Friends', written to enhance the story experience as a grand finale to the book. Delightfully Fun story about Honey Bees and Pollination. Embedded in the story of a Honey Bee who's dreams of being a Queen Bee are doused is the lesson of using your talents to the best of your abilities, finding joy where you are in life, and looking out for others. The story weaves through the actual life of a bee sharing the inter workings of an actual bee hive, the bee's duties, how they find and store food, and how they make honey. As the story ends, the reader will have been thoroughly entertained and learned a lesson about honey bees and their colonies. The book's back matter includes some fun and interesting Buzzing Facts About Bees - environmental stewardship suggestions - as well as easy bake Honey Cupcakes and Cookie Recipes for those Junior Chefs to try out. The Painted Moth is an enchanting children's book which shares a story about a moon moth who is a nocturnal pollinator. A beautiful message of every living thing's uniqueness and self-appreciation is woven into the story line. Being both Educational and Entertaining this book belongs on every child's bookshelf. The companion song - "You Are Beautifully Made" finishes off the reading experience with an emotional tug at the heart strings. "Bows and Butterflies" is a children's storybook about an unusual friendship. If you want the audiobook with music go to Amazon Carol Dabney Music. This is a story about Jane, who has built a habitat for butterflies in her grandmother's garden and befriends a cute little caterpillar named Carlos. Carlos has lots of personality and a big dream to fly. Children will learn about the stages of a butterflies life through this special friendship of Jane and Carlos. This story is bilingual in both English and Spanish. Everyone will fall in love with Carlos and feel all the emotions from discouragement from egg to a beautiful butterfly soaring in the sky. Children will learn about migration and hibernation all intermingled with believing in their dreams. Spanish Translation by Cindy Reyes. A poem by Donna Watkins "On The Wings Of Dreams" has been added to the introduction of this book. Lacing a bit of fiction with a story that educates children is what I try to do in this series of books. These books relate the idea that each form of life depends upon another for its existence. "We are all in this life together" - Responsible Earth Stewardship is the theme throughout the series. Each book carries a message about Character: Friendship, Self-Esteem, Being Your Best. Many of the books are accompanied with songs and skits for the kids to be able to fully be involved with the story by reading, singing, role playing. They hear the story - feel the rhythm of the story and live the story through acting it out. Children love this approach to books.